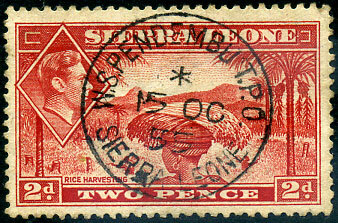 (207.01) */15 OC 1955 on KG6 2d (SG.191a), rarely found on KG6 issues. (010.01) A/MR 6 03 on KE7 1½d orange (SG.101). 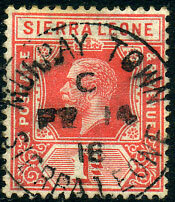 Illustrated Page 4 of "The Postmarks of Sierra Leone 1854-1961 Second Edition" by Walton, Quirk, Hamilton, Horry. (118.02) C/FE 14 18 on KGV 1d (SG.113b). 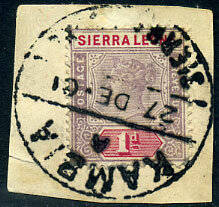 (062.01) A/27 DE 01 on QV 1d (SG.42) piece. 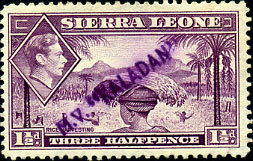 Illustrated Page 48 of "The Postmarks of Sierra Leone 1854-1961 Second Edition" by Walton, Quirk, Hamilton, Horry. (Robertson M.B.4) dated JU 23 ?? 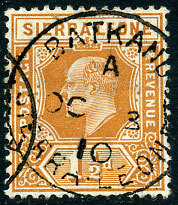 on 1905 KE7 1d (SG.91), slight vertical crease. LVII (without stop) 13.4.11 on KE7 2½d (SG.103). LIII. (with stop) part dated 8.8.2- on KGV 1d (SG.113a). purple str. line on KG6 1½d (SG.190a). 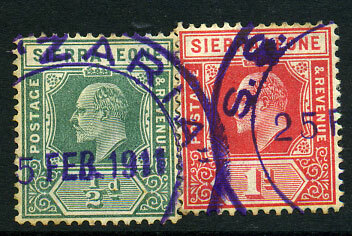 purple ink dated 25 FEB 1911 on hinged together KE7 ?d, 1d (SG.99,100).